It’s almost fall, and with school in session I am busier than normal, just like most moms are at this time of year. While I may be busy, I always make dinner a priority. The good news is that dinner doesn’t have to be stressful, and using your crock pot can make life simple. With colder weather hitting us soon, I thought I would do a roundup of some of my favorite soups with these 25 Slow Cooker Soup Recipes. I love using my slow cooker. In fact, I bet my slow cooker is used at least twice a week. There is nothing better than getting home from a long day at work and sitting down to eat a delicious meal. I love to make soups, and this roundup is one of my favorites I have posted! Check out all of these amazing soups and get your grocery lists ready! You are sure to find a few new favorite soup recipes to add to your growing list of crock pot recipes. 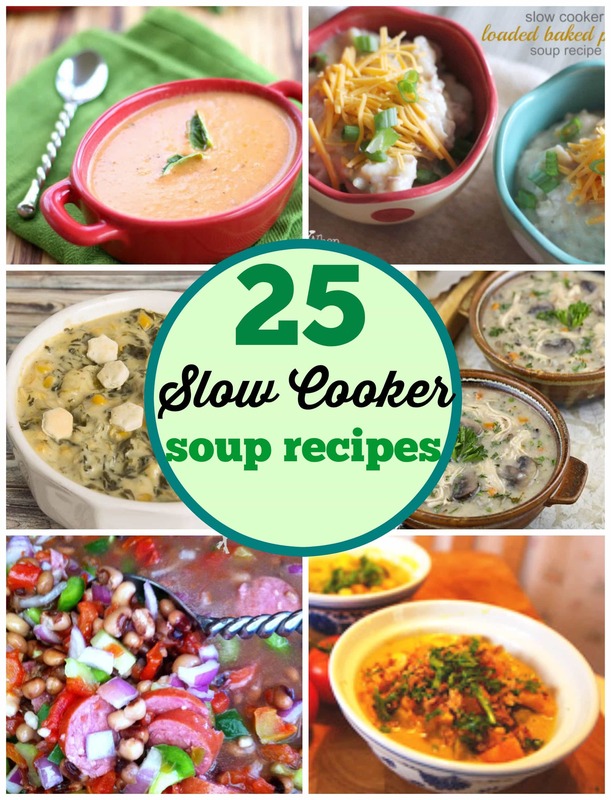 Make sure you check out all 25 Slow Cooker Soup Recipes! I could not put this on Ahalogy fast enough! I love homemade soups more than most things. I’m a big fan of slow cooker soups because they can serve a group at various times… such as before a practice, after a rehearsal, or late at night when you finally get home from being out of town. Getting a peek into my life:)? Ha! You and me BOTH!! Thank you for this round up! Winter will soon be upon us faster than we know it and these will be perfect! Pinned to use later. Thanks again! Advice on how to get non-soup eating children to eat soup. That’s a great question! I try to thicken mine up a bit. For instance, if I am making Tortilla soup, I will add a few tortilla chips to the soup to make it thicker and crunchier. It works for the toddler like a charm! Thanks for including my Chicken Gnocchi Soup! Jennifer, Thanks so much for featuring my taco soup in your crockpot soup roundup! I got a lot of referrals from that post today! SO delicious – thanks for the great ideas! Its clear you’ve done your homework here. Both recipes I’ve made from this list have been fabulous! Thank you so much for this list. And thank you to all the lovely chefs for creating these delicious recipes.